ऐसे उदाहरण देखनेपर आप स्वयं निर्णय करें, कि हमारी हिन्दी के शासकीय शब्द कितने सरल हैं? जब संसार अभिभूत है, हमारी देवनागरी से, और शब्द रचना क्षमता से; हम क्यों उसका तिरस्कार करते हैं? India,divided by complex scripts but not by phonetic sounds needs simple nukta and shirorekha free script like Gujanagari at national level along with Roman script. Instead of printing , Why can’t we have all these 15 laakhs Sanskrit books on line and let the people read through script converter in their chosen script. I read BBC Hindi news through this script converter.You may try it out. 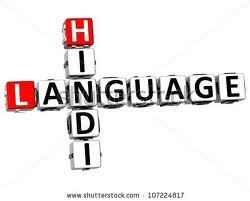 See how many devanagari scripted languages are slowly disappearing under the influence of Hindi/Urdu. Will Urdu survive in Devanagari script? No one is preventing you. English can be learned in Devanagari script through script converter. ऑल् ह्युमन् बिइन्ग्झ् आर् बोर्न् फ्रि ऍन्ड् ईक्वल् इन् डिगनटि ऍन्ड् राइट्स्. ઑલ્ હ્યુમન્ બિઇન્ગ્ઝ્ આર્ બોર્ન્ ફ્રિ ઍન્ડ્ ઈક્વલ્ ઇન્ ડિગનટિ ઍન્ડ્ રાઇટ્સ્. Since we lost the simplicity of Brahmi / Gupta script,How one will write algebraic and chemical formulas in Hindi ?